It’s school holidays here in Australia and Craig doesn’t have much leave from work as I seem to spend it before we get it! 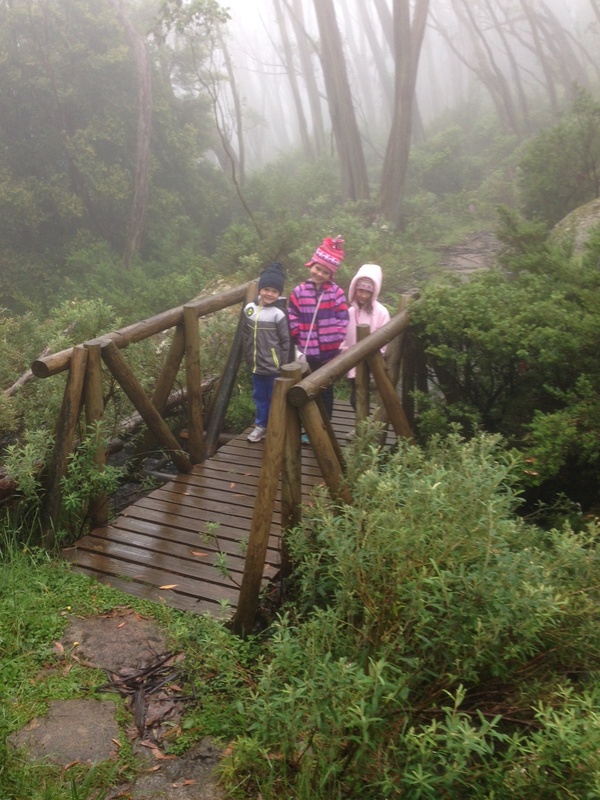 A friend invited me to Mt Baw Baw for a night so I thought it would be nice for myself and the kids to join her. Mt Baw Baw is most commonly known for its ski slopes during winter, not many people would visit during the summer apart from bushwalkers and crazy women having an overnight break with their kids and a friend. I had hoped that we could take the kids on a few trails and maybe have a nice picnic lunch overlooking some of the views from the top of the mountain. Its been pretty hot here in Melbourne lately . Last week we hit above 40 degrees (110F) on 2 consecutive days and the rest of the week wasn’t too bad either. I had expected that it would be a bit cooler up the mountains but certainly warm enough to have a good look around. Maybe the evenings might be a bit cooler and I might need one of my soft cell jackets just for the evening. I packed a pair a tracksuit pants in case the nights were cool if we went out for a bit and my jeans for if we went out for dinner. Our view from the Altitude Apartment window. It was freezing up there. We had a band of miserable weather that blow down from the north and managed to sit itself right over Mt Baw Baw for the duration of our stay. 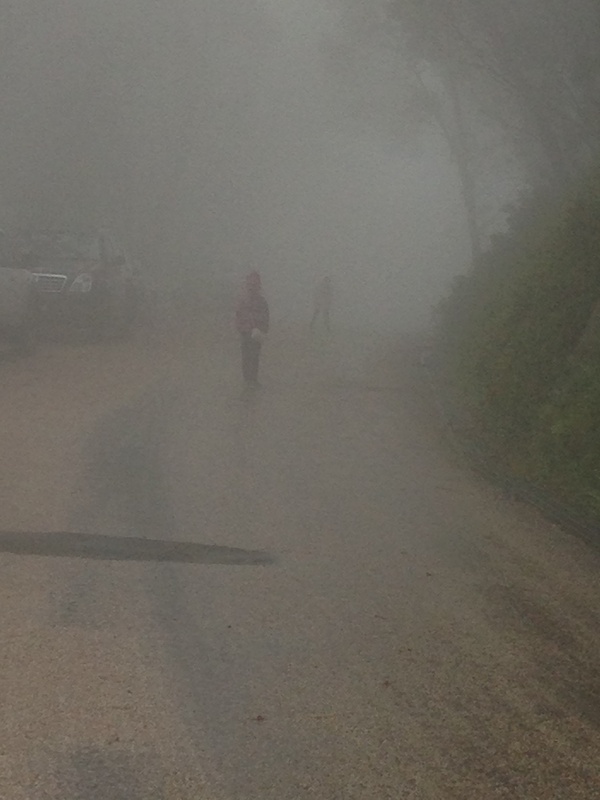 We were completely fogged in, on the drive up, once I turned to climb the mountain, I couldn’t see 10 metres in front of me. It was a very slow drive up, this was at 11.30am! When I got to the top it was drizzling, the type of rain that sets in and hangs around a while – great! Altitude Apartments, we had the top floor right side. We took our luggage upstairs and I thought while I get organised I will put a DVD on for the kids and figure out what we were going to do. The kids were very happy to sit and watch Scooby Doo for a bit and have some lunch while I sorted out beds and unpacked. As I said earlier, we met my friend up there and she had arrived the day before after jumping off a flight from Bali that morning. She had a bit of a look around in the morning before it started raining and she said it had rained ever since, a good 24hrs of rain at that stage. Surely it has to stop raining soon, right. About 4pm we had a brief break in the rain so we put on our winter woollies (jackets, track pants, sneakers and beanies) and headed off to have a look around. There was very little open, the reception was open where we were informed that we were one of 2 sets of visitors on the mountain and this was the worst weather they have had since September! Great, had to be the 2 days that we were there. There was a little café/bar open but we had left our purses in the apartment. turns out that was pretty convenient as it kept us moving along. The road in front of the apartment. We continued on and had a walk along a little trail for about 1km, it was really pretty, what we could see and Caelan nearly stood on a land yabbie which my friend informs me is quite rare to see them out and about during the day. It had a beautiful orange body with bright blue nippers, although I wouldn’t want to get too close to those nippers! The land yabbie Caelan nearly squashed. It was back to drizzling by now so we were all getting pretty wet, particularly our sneakers as we all had soaking socks underneath. We decided it was time to head back to the apartment. My friend had booked the outdoor Jacuzzi for an hour for the kids so we put their togs on and headed out again to the other side off the lodge to put them in the Jacuzzi. It was lovely in the water and they had a nice time splashing around and they eventually calmed down and had a relaxing soak. Then it was time to get out in the cold and make the dash back to apartment. I wrapped their towels around them and off we dashed! All relaxed in the Jacuzzi. The kids kept asking what’s for dinner and my friend told them ‘gumleaf soup’! We strung them along for a while and even got them to go outside and collect some gum leaf’s! We boiled them in a saucepan and pretended to give them the soup, they thought it was awesome. Keira just asked Craig if he knows how to make ‘gumleaf soup’, think we fooled them much! We then gave them pasta for dinner which they hoovered down real quick! Picking the leaf’s for the gum leaf soup. They settled in and watched Harry Potter and then went to bed whilst my friend and I had a quiet beer and then followed suit hoping to wake up to a rain and cloud free day, weren’t we silly! It rained all night and we were still fogged in this morning so had a quick breakfast and headed down the mountain. It was a slow drive down in the wet and foggy and we stopped for lunch in Drouin and then headed home. The apartment at Altitude Apartments was average, if I paid $600 a night for that in peak snow season I would be pretty disappointed. It was very small for a 2 bedroom unit and it was a fair hike from the car park and up all the stairs to the room. In the off season (summer) accommodation goes cheap just to get people up there. It might have been nicer if the fog lifted and we could see the views but I felt it was a bit run down and a section of the roof in the bathroom fell in which could have been from all the rain. We were the only ones staying there so it was very quiet. The beds were comfortable and all the heaters worked. It was great to have a self contained unit so that we could make our own dinner. I would like to return one day and have a look around, the surrounding area is very pretty and there’s plenty of hikes to do in the area for various levels of fitness. If we could have got out a bit more the kids would have had a ball. Safe travels, Sydney’s next for Australia Day next weekend.